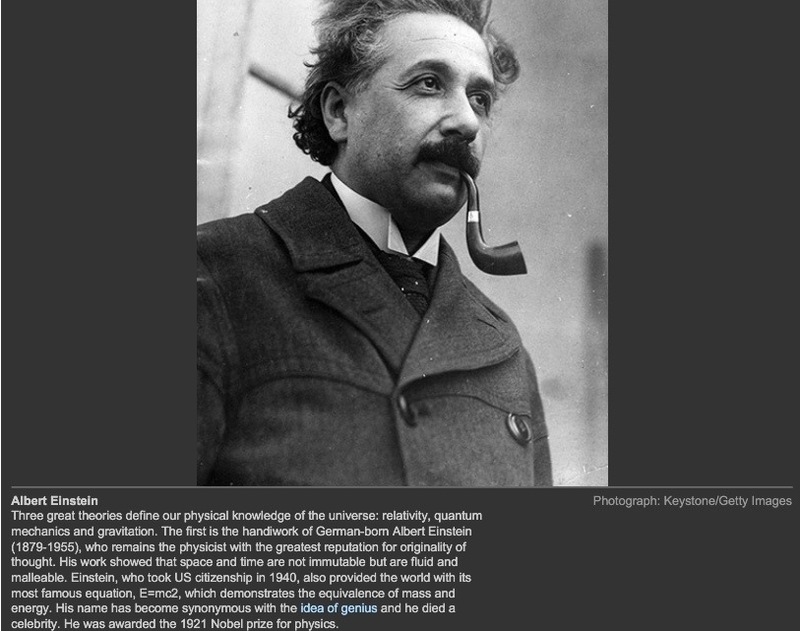 At number 4 in The Guardian’s list of the ten best physicists is Albert Einstein. The fact that Einstein is at number 4 in this list of “ten best physicists” leads me to believe that this list is not in any particular order. I can’t imagine there would be anyone who would not place Einstein alongside Newton as being one of the two greatest physicists in history. Quite simply, Einstein revolutionised our understanding of Physics and of the Universe. He overturned the absoluteness of Newtonian mechanics, replacing it with his theories of relativity. He was also instrumental in our understanding of the World at the atomic scale. His name is now synonymous with genius, we all understand what a phrase like “he’s not an Einstein” means. Albert Einstein was born in Ulm (in present day Germany) in 1879. His father Hermann and his mother Pauline (née Koch) were also both German. In 1880 the family moved to Munich where Einstein’s father and uncle started a company manufacturing electrical equipment running on direct current electricity. In 1894 this company failed, when alternating current became the standard worldwide for distributing electricity. The family moved to Italy, but Einstein stayed in Munich to finish his studies. In 1896, having obtained top marks in his mathematics and physics exams, Einstein enrolled on a 4-year mathematics and physics teaching diploma course at Zurich Polytechnic. He graduated in 1900. During his time at Zurich Polytechnic he became romantically involved with a classmate, MIleva Mariƈ. They married in 1903, by which time Einstein was working as a patent clark in the Swiss Patent Office. In 1905 Einstein had his annus mirablis (miraculous year). He completed his PhD at the end of April from the University of Zurich, and then proceeded to publish five important papers, four of which are generally recognised as being great works of physics in their own right. I will discuss these five papers below, but by 1908 his work from 1905 had gained enough attention that he was appointed a lecturer at the University of Bern. Einstein was only at Bern for one year, in 1909 he was offered a lecturing position at the University of Zurich, and then in 1911 was offered a full Professorship at the Charles-Ferdinand University in Prague. In 1914 he was appointed the Director of the Kaiser Wilhelm Institute for Physics and made a Professor at the Humboldt University in Berlin, arguably Germany’s most prestigious university. In 1919 Einstein became a celebrity when Sir Arthur Eddington verified one of the key predictions of Einstein’s theory of gravity, his General Theory of Relativity. Newspaper headlines around the World acclaimed him, and from that year on his life was never the same. In 1921 he was awarded the Nobel Prize in Physics for his work on the photoelectric effect. In 1933, with Hitler coming to power in Germany, Einstein seized on the opportunity of a visit to the United States to “defect”. He never returned to Germany, and with many academic job offers to choose from he settled at the Institute for Advanced Study at Princeton University in New Jersey, USA. It is there he saw out the rest of his career, dying in 1955. It is difficult to know where to start in discussing Einstein’s contributions to Physics. As I said above, alongside Newton, Einstein stands as one of the two most important people in Physics. Time Magazine decided to make Einstein their “Person of the Century”, placing above all the 20th Century’s great statesmen. Why? Einstein changed our perception of our Universe. He will be best remembered for his two theories of relativity. In 1905, as the third paper in his annus mirablis, he published a paper entitled “On the Electrodynamics of Moving Bodies”, a fairly innocuous title. But the contents were far from innocuous, it asked us to accept the idea that if two observers are moving relative to each other they will always measure the speed of light to be the same. This has far reaching consequences. It means that time passes differently depending on how you are moving, it means that lengths will be measured differently, and it means that the inertial mass of an object will change as its speed increases. Later in the same year, Einstein wrote a paper entitled “Does the inertia of a body depend upon its energy content?”, and this paper introduced what has become the most famous equation in Physics, , showing that mass and energy are equivalent. These two papers together describe the ideas of what we now call Special Relativity. Before publishing his paper on the electrodynamics of moving bodies, Einstein published a paper which would win him the 1921 Nobel Prize. This was a paper on the photoelectric effect, a phenomenon which had been known about for several decades but for which no-one had a successful explanation. The photoelectric effect is when electrons are released from the surface of certain metals when a light is shone upon the metal’s surface. The experimental results of this phenomenon could not be explained with the accepted “wave theory” of light. Einstein extended the idea of “light quanta”, which had first been suggested by Max Planck in 1900 to explain blackbody radiation. Einstein suggested that light could be thought of as individual quanta of energy (what we now called photons), with the energy of each photon given by where is Planck’s constant and is the frequency of the light. This simple but revolutionary idea explained the results of the photoelectric effect perfectly, and was the beginnings of having to think of all sub-atomic phenomena as a combination of waves and particles, something which is at the heart of Quantum Mechanics. In 1905 Einstein also published a paper explaining Brownian motion as the jostling of pollen grains by molecules in the liquid in which the grains are suspended. This was one of the first direct proofs of the existence of atoms. With the five papers Einstein published in 1905 he was destined to be an important physicist. But what propelled him to being considered the greatest physicist next to Newton was what came next, his General Theory of Relativity. Einsteins’ General Theory of Relativity is his re-working of Newton’s theory of gravity, which had been around for over two hundred years and which most physicists felt was as correct a theory as any that had been developed. But Einstein realised that Newton’s way of thinking about gravity was incompatible with his earlier Special Theory of Relativity. Over a period of some seven years, from 1908 to 1915, Einstein worked out the mathematical details of his theory, and when it was finally published it was even more revolutionary in some ways than his Special Theory of Relativity. It asked us to think of gravity not as a force, but as a bending of space-time. Masses cause the space-time continuum to deform, and in this deformed continuum objects move along the shortest path. I am not going to go into too much detail here, but will explain many of the most important ideas and predictions of General Relativity in series of future blogs. Suffice it to say that, to date, his new way of thinking about gravity has withstood every test to which it has been put, and is considered one of the most important theories in physics, as well as one of the most beautiful. Einstein made many other contiributions to 20th Century Physics, including the Einstein coefficients which enable us to work out how long electrons will spend in different energy levels in atoms, and Bose-Einstein Statistics, which is how particles which are indistinguishable from each other behave in a statistical way. It is difficult to imagine where Physics would be today if it weren’t for Einstein’s contributions. Some people have argued that, whereas his Special Theory of Relativity was just waiting to be discovered (indeed, in a talk in 1904 the French mathematician/physicist Henri Poincaré suggested the idea of the relativity of time), his General Theory was so revolutionary that it required someone with Einstein’s genius to even think of it, and that no other physicist before or since could have thought of it. Einstein’s name towers over Physics like no one else, except of course for Isaac Newton, whom I will talk about in a few weeks’ time. You can read more about Albert Einstein and the other physicists in this “10 best” list in our book 10 Physicists Who Transformed Our Understanding of the Universe. Click here for more details and to read some reviews. 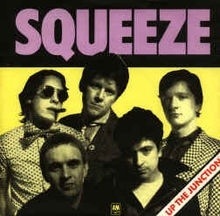 Just time for a very quick post today, this great song “Up the Junction” by the 1970s-80s band Squeeze. “Up the Junction was released in May 1979 and got to number 2 in the singles charts in the Disunited Kingdom. Squeeze’s songwriters were the band members Chris Difford and Glen Tilbrook. The lyrics for this song were written by Chris Difford who generally wrote the lyrics, with Tilbrook generally writing the melodies. If you listen to the lyrics of this song you will hear that they not only tell a story, but are very clever. 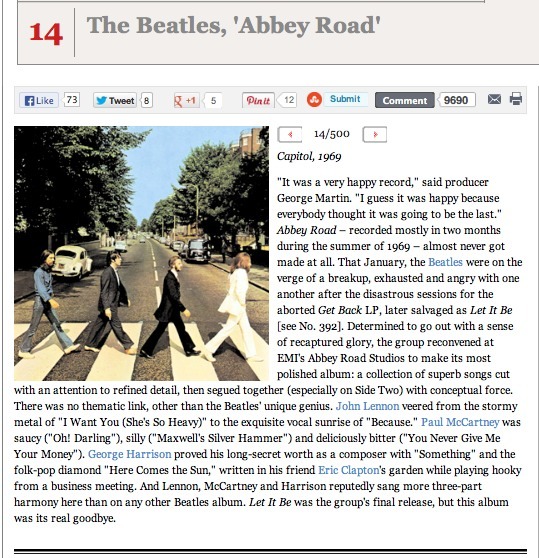 At number 14 in Rolling Stone Magazine’s 500 greatest albums is “Abbey Road” by The Beatles. It shouldn’t come as any surprise to anyone that The Beatles dominate the top 15 of this list of greatest albums. They have five (5!) albums in the top 14, with four in the top 10. This is testimony to the massive influence The Beatles have had on popular music, more than any other artist since “Rock ‘n’ Roll” came about in the 1950s. When The Beatles’ music finally became available on iTunes the advertising slogan Apple Computers (not Apple Corps, the Beatles’ record label) used was “The band that changed everything”, and that pretty much sums it up. “Abbey Road” is one of my favourite Beatles albums. I have already said that the number one album in this list is their seminal album “Sgt. Pepper”. Personally, I prefer “Abbey Road”. My favourite Beatles album is “Revolver” (which is in the top 10), and my second favourite is this album, “Abbey Road”. By the time this album was recorded, The Beatles knew the end had come. They were barely talking to each other, and each of them was pursuing their own projects. But, by all accounts, the recording sessions for “Abbey Road” were happy and harmonious, in stark contrast to the acrimony that beset the recording of what would become “Let it Be”. Maybe it was because they knew it would be their swan song. The variety of songs on this album is quite breathtaking. George Harrison contributed two wonderful songs, “Here Comes the Sun” (which I included in this blog), and the song Frank Sinatra described as “the greatest love song ever written”, “Something”. Even the songs written by John Lennon range from the funky “Come Together” to the heavy metal “I Want You (She’s So Heavy)” to the beautiful “Because”. “Because” is the song I’ve decided to include here, not just for the wonderful lyrics, but also the beautiful three-part harmonies Lennon, McCartney and Harrison sing in the song. Which is your favourite song on “Abbey Road”? Tomorrow (28th of August) marks the 50th anniversary of what has become one of the most famous speeches in history, Martin Luther King’s “I have a dream” speech. The speech was part of a “March on Washington for jobs and freedom”, which was organised by 6 civil rights organisations. 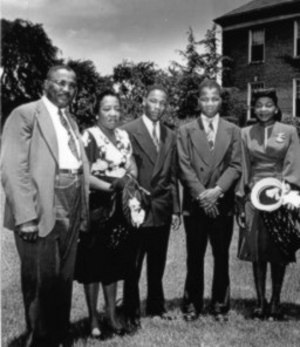 These were King’s “Southern Christian Leadership Conference”, The National Association for the Advancement of Colored People” (NAACP), “The National Urban League”, “The Brotherhood of Sleeping Car Porters”, “The Student Nonviolent Coordinating Committee” (SNCC) and “The Congress of Racial Equality”. The day included many performers and speeches. Bob Dylan and Joan Baez sang together, but for most people the highlight was King’s speech. Martin Luther King giving his “I have a dream” speech on the 28th of August 1963. I suspect nearly everyone is familiar with the “I have a dream” part of this speech. But in the video clip below is the complete speech, which is some 16 minutes long. The “I have a dream” part doesn’t begin until the 12th minute, and I would imagine a lot of people are not famiiar with what King says before the famous finale. I am trying to remember when I first became aware of this speech. I think it was when I was about 12 or 13 years old. I know from talking to my children that they are now introduced to the ideas of King, Mahatma Ghandi and Nelson Mandela in their “religious education” classes, something we were not when I was in school. Although I am a little vague as to when I first became aware of the “I have a dream” part of this magnificent speech, I do remember distinctly when I first became aware of the beginnings of the speech. It was in 1998, and I had bought a DVD of the Encyclopaedia Brittanica, and it had an article on this speech including a video of the complete speech. This was in the days before YouTube, and it was the first time I had heard the opening parts. Within a few months of King giving this speech, John F. Kennedy was assassinated. Initially it seemed as if the hope of meaningful civil rights legislation had died with him; Lyndon Johnson had never shown much support for this cause. But, to many people’s surprise, Johnson pushed through the landmark Civil Rights Act in 1964, ensuring most forms of racial segregation in the US were outlawed. In the years that followed this famous I have a dream speech Martin Luther King would go on to accomplish many other great things, including being the youngest ever recipient of the Nobel Peace Prize in 1964. He was assassinated in Memphis, Tennessee on the 4th of April 1968, and towards the beginning of April next year I will write the fourth blog in this series, summarising his life from this speech through to his death only four and a half years later. In mid-1955, Martin Luther King was preparing for a settled, domestic life. He had become pastor of Dexter Avenue Baptist Church in Montgomery, Alabama. His wife Coretta was pregnant with their first child. Little did he know how much his life was about to change. Yolanda was born on the 17th of November 1955, and as any new parent knows the arrival of a baby is quite a shock to the system. But, if this were not change enough, King’s life was about to change in a way he could not possibly have imagined. On the 1st of December 1955, Rosa Parks refused to give up her seat to a white man on Montgomery’s segregated public bus system. The blacks (“colored” or “negros” as they were referred to at the time) had their own section of the bus. But if the white section was full, a white person could demand a seat in the “colored” section, requiring a black person to give up his or her seat. 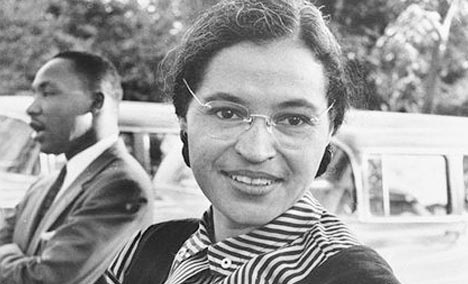 Rosa Parks refused to give up her seat, and was promptly arrested for breaking the law. The local president of the National Association for the Advancement of Colored People (NAACP) was E.D. Nixon. In a meeting within days of Rosa Parks’ arrest, an organisation called the Montgomery Improvement Association (MIA) was formed, and Nixon saw to it that the charismatic 27-year old King was appointed the leader of the movement which would oversee a boycott of the Montgomery public bus system. This propelled King to local and soon national prominence. The boycott was a huge success. 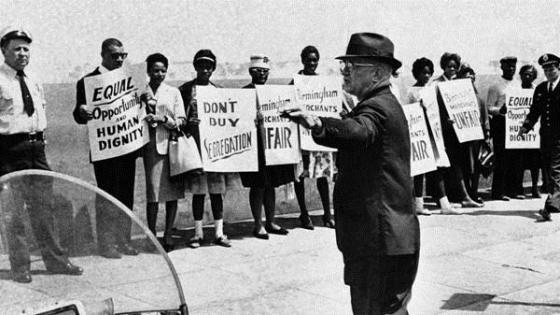 Between the 1st of December 1955 and the 20th of December 1956 there was an almost complete boycott of the city’s public transport system by the city’s blacks. The boycott came to an end when the US Supreme Court declared Montgomery and Alabama’s laws on segregated buses to be unconstitutional. King’s role in the successful Montgomery Bus Boycott made him into a national figure, the best known spokesman and the de-facto leader of the civil right’s movement. vehicle for much of the civil rights protests in the segregated south of the late 1950s and early 1960s. 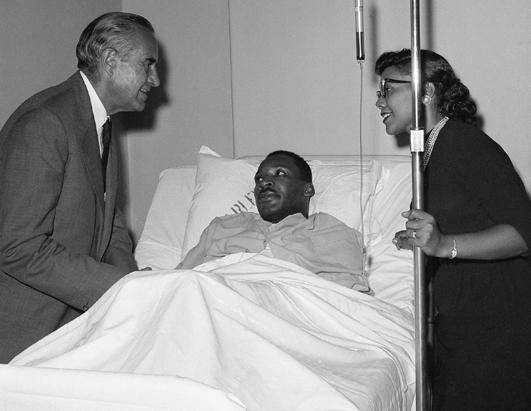 In 1958 King was signing copies of his book “Stride Towards Freedom” in a shop in Harlem, New York City, when he was stabbed in the chest by a deranged black woman, Izola Curry. King’s survival was touch and go, the knife had pierced his chest and was within fractions of a centimetre of his aorta. It is said that he was told that had he sneezed, with the knife in his chest, his aorta would have been severed and he would have died. 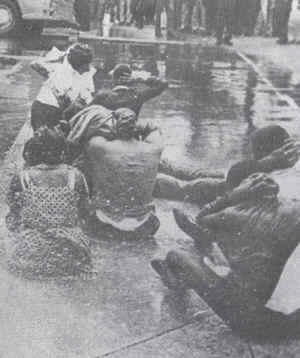 In the spring of 1963 the SCLC decided to wage a campaign to de-segregate Birmingham, the industrial capital of the south. The protests were in many forms, including occupying public spaces with sit-ins and marches, and defying the City’s segregation policies by deliberately breaking laws the protestors deemed to be unjust and racists. The City’s Police commissioner was a Eugene “Bull” Connor, and he ordered his department to break up any protests with any force necessary. 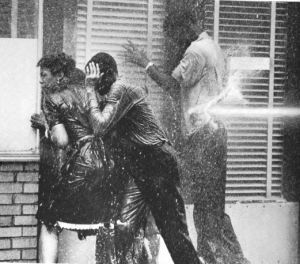 Soon the nation’s television screens were filled with horrific images of passive protestors being attacked by police dogs, by police with their truncheons, and with high pressure water hoses. Hundreds of protestors were arrested. With so many going to jail, King felt compelled to join his fellow campaigners in jail. He took part in a peaceful sit-in, and deliberately got himself arrested by refusing to move when asked by the Police. It was the thirteenth of a total of twenty nine arrests in his lifetime, and during his time in jail during this campaign he wrote his now famous book “Letter from a Birmingham Jail”. Here is an interesting short video about the “Birmingham campaign”. The campaign was an overwhelming success. On the 8th of May the City caved in to the unrelenting pressure. Bull Connor was sacked, and the City tore down most of its segregational signs and became integrated. It was a huge success for the civil rights movement, and propelled King to international fame. 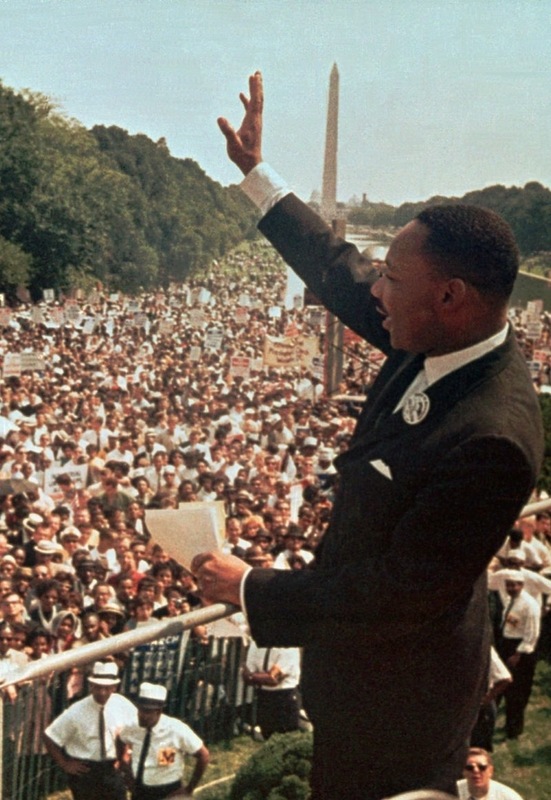 With the success of the “Birmingham campaign” behind him, King became involved in a “march on Washington”, planned for the 28th of August 1963, where he would be amongst a number of speakers and performers. As I will discuss in tomorrow’s blog, his speech that day has gone down in history as one of the greatest speeches of all time. On Wednesday (28th of August) it will be 50 years to the day since Martin Luther King (Junior) gave his most famous speech, his “I have a dream” speech. To mark this momentious anniversary, I have decided to blog about this incredible man over the next three days. Today (Sunday), I will summarise his early life, up to his coming to national prominence. On Monday I will blog about his life from coming to national prominence to his “I have a dream” speech, and on Tuesday I will blog about this speech. The fourth part of this blog needs to be about his life after this speech through to his assassination on the 4th of April 1968. But I have decided to do that nearer the time of that anniversary, in early April. Martin Luther King was born in 1929 in Atlanta, Georgia. His father, Martin Luther King Senior was born in Stockbridge, Georgia, was a reverend in Atlanta. His mother, Alberta Williams, was from Atlanta. Both King and his father were actually both born as Michael King, but King’s father changed both of their names in 1934 to Martin Luther after a trip to Germany, in honour of the great German reformer Martin Luther. King was the middle child of three, with an older sister Willie Christine and a younger brother Alfred Daniel. As a teenager, King was quite doubtful of many of the teachings of Christianity. For example, at thirteen he denied the concept of Christ’s resurrection, but as he matured he decided that the Bible contained “many profound truths which one cannot escape”, and he decided to enter the seminary to become a minister. 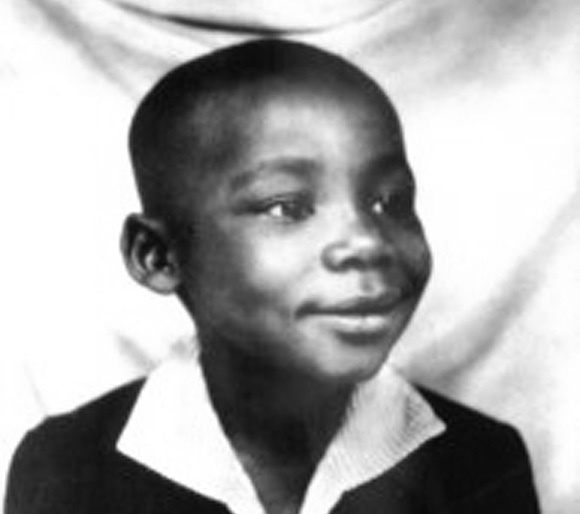 King attended Booker T. Washington High School in Atlanta, and was a highly intelligent student. He skipped both ninth and twelfth grades and entered the famous Morehouse College in Atlanta at fifteen years of age. In 1948, at the age of 19, he graduated from Morehouse with a B.A. in sociology, and then enrolled at the Crozer Theological Seminary in Chester, Pennsylvania. He graduated from this seminary in 1951 with a Bachelor of Divinity. In June 1953 he married Coretta Scott, and together they had four children, Yolanda, Martin Luther III, Dexter Scott and Bernice. In 1954, at twenty five years of age, King became pastor of Dexter Avenue Baptist Church in Montgomery, Alabama. Meanwhile he was studying for his doctorate, and received his PhD in June 1955, his dissertation was entitled “A Comparison of the Conceptions of God in the Thinking of Paul Tillich and Henry Nelson Wieman”. 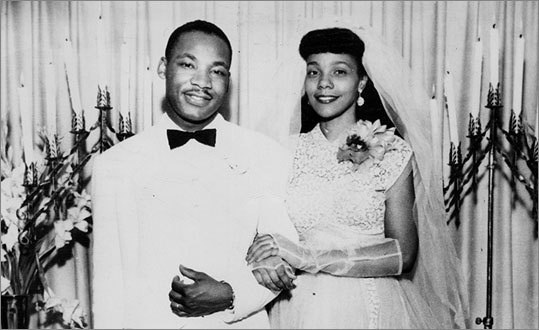 King marrying Coretta Scott in June 1953. In mid 1955 King had his ministry and Coretta was pregnant with their first child. He had just received his PhD. He probably fully expected to settle into a life of domestic bliss whilst ministering his church. Little did he know that the events of later in the year would cause a sharp deviation in his life, and propel him to national and international attention. I will talk about those events in tomorrow’s blog. 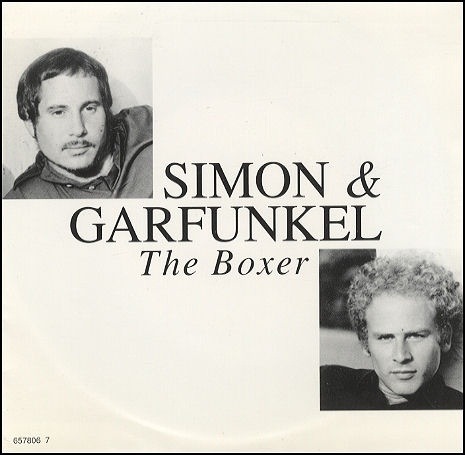 Just a quick post today of this amazing song by Simon & Garfunkel. There are many songs I like by this duo, dozens; but this is one of my favourites. “The Boxer” was on their last album, “Bridge Over Troubled Water”. “The Boxer” was released in April 1969, reaching number 7 in the US charts and number 6 in the Disunited Kingdom charts. Which is your favourite Simon & Garfunkel song?